The Blast-o-Matic is a powerful, laser-firing weapon developed by the Kremlings under King K. Rool's orders in Donkey Kong 64. A majority of K. Rool's ship, Crocodile Isle, consists of the Blast-o-Matic. This machine is powered by a central core, which is connected to five rooms, each with their own colored power generator; the color for each power source corresponds to one of the five Kongs. The device is capable of firing a laser from three brass rings surrounding a metal arrowhead pole. The arrow of the machine comes out from the belly of Crocodile Isle. Prior to the game's events, Snide was the lead for the Blast-o-Matic. K. Rool eventually became paranoid of Snide and fired him. He lost access to the weapon's blueprints, which K. Rool split apart and handed a piece to each of the Kasplats. The game's intro shows K. Rool heading to DK Isles, plotting to blast it with the Blast-o-Matic. However, as Crocodile Isle steers quickly on the water, it accidentally hits into a rock. Both the ship and the Blast-o-Matic break. The Kremlings work on repairing the machine for a large portion of the Kongs' adventure. When the Kongs enter Gloomy Galleon for the first time, a cutscene plays, showing K. Rool telling a Kritter, the Blast-o-Matic's new chief technician, that he trusts the Blast-o-Matic to almost be ready for activation. The Kritter says the machine is unfinished, and in response, K. Rool sends out Klaptrap guards to ensure that the Kritters do not escape until they finish repairing the machine. Later, when the Kongs first enter Creepy Castle, a cutscene shows a Kasplat trying to escape from Crocodile Isle, hoping that K. Rool does not find out about the Kongs recovering the lost blueprints to the Blast-o-Matic, which he describes as a "stupid machine". In the final world, Hideout Helm, the main goal is for the Kongs to deactivate the Blast-o-Matic within the time limit, which varies depending on how many blueprints that the Kongs have recovered for Snide. To deactivate the machine, each Kong must complete two Bonus Barrel challenges just outside their corresponding power source. When a Kong completes their challenges, the corresponding power source is deactivated. The Blast-o-Matic becomes fully deactivated when every Kong completes their series of challenges. Failure to shut down the Blast-o-Matic on time results in a Game Over cinematic where K. Rool lets out an evil laugh, then presses a few buttons to activate the Blast-o-Matic. The machine comes out from the ship and points at DK Isles. The sequence stops just before it allegedly takes fire at DK Isles. The Blast-o-Matic appears as K. Rool's Final Smash in Super Smash Bros. Ultimate, essentially as a recreation of the game over sequence from Donkey Kong 64 down to K. Rool having to press the button multiple times while laughing maniacally before it fires, only this time, the results of him firing the cannon are actually shown. It also appears as a collectible Legend rank support spirit that increases the damage dealt to giant opponents. Krokoblaster From крокодил (crocodile) and бластер (blaster). The Blast-o-Matic is mentioned in K. Rool's trophy description in Super Smash Bros. Melee. The Blast-o-Matic was named the "Super Gun" in a prototype build of Donkey Kong 64. 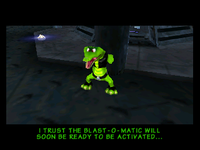 Elements of the Blast-o-Matic's design resembles the Big-O-Blaster from Banjo-Tooie, and even had a similar purpose and naming convention. As both Donkey Kong 64 and Banjo Tooie were created by Rare within the same time period, the similarity was most likely intentional. This page was last edited on March 30, 2019, at 12:48.